The Catholic church certainly has a black eye or two from recent events that don’t need to be rehashed here. When things go bad, that dominates the headlines – and that comes with the territory for the world’s largest Christian religion. 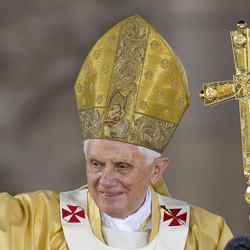 Most observers marvel at 85-year-old Pope Benedict XVI’s historically significant decision to resign from the papacy. They have commented on how it represents true leadership and the courage to know when it’s time to step down and put the institution’s interests above his own. I choose to view Benedict’s resignation – the first for a pope since Celestine V in 1294 – through the prism of PR and reputation management. Here’s a guy – yes, he may be the spiritual leader of 1.2 million Catholics, but he’s ultimately a guy with a really big job and reputation to protect – who decided to get out in front of the news, take a bold stance and weave the story as he wants told, employing his own take on brand journalism. His other option was to eventually die and have little say on the final act of his legacy. Whether the pope is following God’s will, crafting his own brand story or writing a new chapter in crisis communications (a decoy story, perhaps? ), he is being proactive, and that’s part of the equation for success in public reputation management. Remaining silent and complacent allows others – critics, the public and the media – to tell your story as they see it. Benedict’s jaw-dropping announcement this month also delivers a singularly monumental, positive-spin story for an institution that can ride this wave of good PR for awhile. I choose to believe the impact of the pope’s announcement is calculated and all part of a concerted PR strategy. A key lesson here is – whenever possible – to take the bull by the horns and craft the narrative that puts the best face on your reputation or that of your company. If the pope can enhance the Catholic brand even just a little, there’s huge potential for us mere mortals.